The first ten million games were the worst. And the second ten million games, they were the worst too. The third ten million games I didn't enjoy at all. After that I went into a bit of a decline. 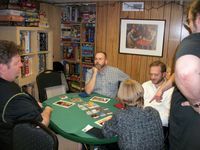 On October 12, 2013 twenty-three mostly harmless gamers found their way past the missing stairs and Beware of the Leopard sign and into the Official CBBS Gaming Basement, where they figured they might as well play some games. They included Tim, Darin, Jerry, Elden, Suzie, Counterclockwise Scott, Eric Classic, Nyck, Nathaniel, Caleb, Aaron, Leif, Shawn, Tom, Andy, Alan, Cymi, Levi, Ori, Geoff, New Eric, Kelli, and Ben. We at the CBBS know how to party - by staring quietly at a board and occasionally calling out a number. Accordingly, started with Ricochet Robots. Hooray! Solve this one in less than eleven moves, and win a prize worth up to one million dollars (Canadian). 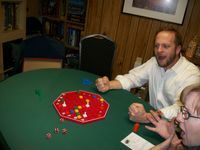 Darin, Jerry, Elden, Tim, Counterclockwise Scott, Eric Classic, Nathaniel, Caleb, Suzie, and Aaron all scored at least one chip. Pastafazool! But enough of that foolishness. 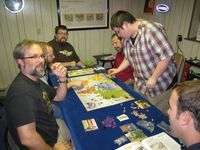 To begin the very serious business of game playing, Suzie, Leif, Nyck, Eric Classic, Caleb, and Nathaniel found themselves at Table Three, playing the very serious Spiel Des Jahres candidate, Rise of Augustus. 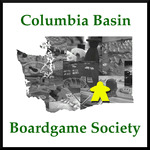 Caleb scored 59 points for the victory, followed by Eric Classic with 42, Nathaniel at 40, Nyck with 38, and Suzie at 37. Hooray! Sadly, Leif totally cheated by misreading his "take another objective" power as "complete another objective", so his final score was not recorded. The plan on Table One was to play a quick game of the classic Modern Art, which would not require much splaining as we had just played it recently. 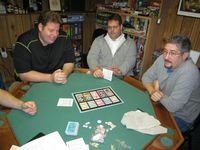 However, it turns out that of Tim, Elden, Darin, Jerry, and Shawn, who sat down to play, only the first two had played in that game, so yet another bout of intense splaining was necessary. Boo! Fortunately, even with splaining this game hums right along. It also defies analysis, as it always seems you are paying too much and getting too little for your paintings. There is also an element of groupthink, as well - if everybody is "overpaying" for their paintings, then you have to overpay as well or risk never getting any paintings at all. And, somehow, the "buy very few paintings" strategy never seems to do well, which suggests that perhaps everybody wasn't overpaying after all - or that the downside of overpaying gets distributed more evenly than the upside, or something like that. It would take a scientist to explain it all. 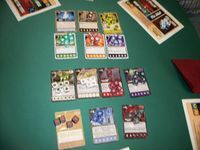 Anyway, despite Tim's misgivings, he ended up having pretty good cards (lots of Karl Gitters and Kryptos, both of which scored in three of the four rounds) to sell off and control the auction rounds with, which let him gain $459 for the victory. Jerry bought a lot of Art while Shawn was able to sell his at a high price; they finished with $394 and $396 respectively. Elden still seems to undervalue the art on sale (I had the same issue the first half-dozen times I played), which led him to miss out on some key auctions and finish with $304. Darin ended up with $194. 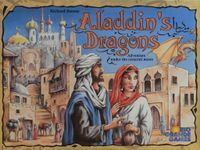 Table Two, out of nowhere, decided they wanted to play Aladdin's Dragons. Que? Anyway, Tom, Aaron, and Andy were game. Many dragons were slain, magic items stolen, palace locks picked. Also, Andy won, 8 to 7 to 6. Hooray! Somewhere, somehow, Alan, Cymi, Levi, Ori, and Goeff managed a game of Dominion. Geoff scored 36, Alan 34, Cymi 28, Ori 25. It appears that Tables One and Three finished at roughly the same time. Yet, the Table Three-ers decided to stay at Table Three, and the Table Oners stayed put as well. I guess they all just hate each other. 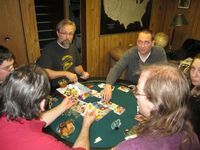 Anyway, Leif, Nathaniel, Caleb, Suzi, Nyck, and Eric One played King of Tokyo, in between casts of the stinkeye towards Table One. Everyone was cowardly for the opening turns, leaving Tokyo at the slightest opportunity. Caleb was the first to stay in Tokyo, where he was soon joined by Nyck. Meanwhile, Leif Killed Suzie and Eric with a spiteful air strike on all monsters. Nathaniel used his Evolution to shake people down for energy, but was eventually killed by Nyck's five claw attack from Tokyo. But, Caleb soon killed Leif, and stayed in Tokyo long enough to achieve a Fame win. Hooray! 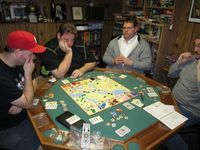 Despite constant interruptions to stop and crack wise about Table Three's mamas, Elden, Shawn, Tim, Darin, and Jerry managed to play a speedy game of Samarkand: Routes to Riches. Tim started off buying into Blue, with the idea to quickly connect to Pink on the 19 goods spot (which he had), to get enough money to buy into Pink as well. He'd then connect both to his 18 card and then spread out. Unfortunately, he failed to realize that Shawn had already bought into the Pink family, which only complicated all those plans, as it meant Shawn could just as easily make those early connections which often make the difference in this game. 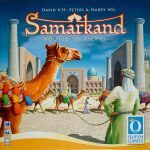 One of the interesting and/or frustrating parts about Samarkand: Routes to Riches is that it is often really hard to set yourself up to score the connection points, since building two away from somebody means he is also two away from you. So it often turns out to be a game of chicken, of who will approach who first. 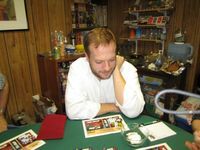 Fortunately for Tim, he was able to pivot to Red instead of Pink, picked up some other connection points, and maximized a couple of his cards, to finish with 40 points. That was good enough for a tie with Jerry, who bought into three families and also grabbed some key connection points. Darin ended up with 29, while Elden and Shawn both scored 28. 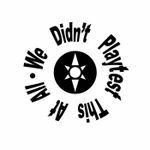 Some subset of us needed to kill another ten minutes, so we played We Didn't Playtest This At All, which was designed for such a purpose. Tim and Leif won game one, when Tim got tired of trying to out RPS Leif and played the "Everybody Wins" card. Then Tim and Elden won in some other way, and then Tim won by himself just by being awesome. Finally, Leif, Suzie, and Shawn all won after Suzie thinned the herd with a "You" card - after Jerry controversially asserted that "yourself" didn't violate the rule. Yes, well, hmm. 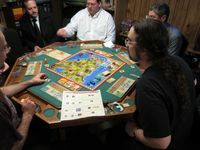 At long last, Eric, Nathaniel, Geoff, Nyck, and Andy were able to get in Game 10 of the CBBS Risk Legacy project. As always, Eric has his own report of the game, so why don't you stop bothering me and go read that? 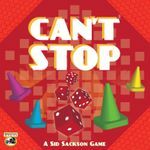 As part of the reconfig Elden, Shawn, Tim, Caleb, and Darin found themselves on Table One playing Lancaster, which we had just played the previous weekend in an undocumented Big Game Saturday event. This time, we were hoping to avoid the misunderstandings and play the game by the actual rules. In that, it appears, we succeeded! This time around, we did not spend quite so much time in France and fought over the Counties, instead. 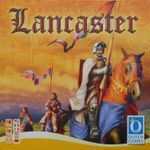 One of the interesting things about Lancaster is that you can't always "do what the other players aren't doing", because if nobody comes to France with you, you lose your Knight for another turn as the war drags on. On the other hand, you still score some points even if you don't win the war right away, and the King's Favors are hugely important, so there's always a reason to play in France. Anyway, Tim usually took money when fighting in France, initially to score the original Law card for most coins and later to make sure he had 3 coins available to score both bonuses in each county. 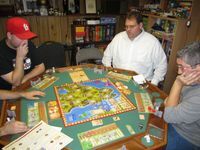 He actually got one Noble in each of the first four rounds and two in the final round, making his Table worth 21 points. He came in second for Knight levels and scored regularly in France and with the Laws (we had several turns where presence at each French Battle was worth three points, and each squire and coin could buy 1 VP in the final Law session); his final total was 51. ...which was good enough for second place, as Shawn somehow managed 57 points. He got one fewer noble but won the most Castle improvements by virtue of his extra coins (seriously, I don't see how you guys do that, as every time I try to improve my castle somebody parachutes down half a dozen squires on my head). He must have scored well in France and at the Laws, and on the final turn was able to grab the big 4-Knight County worth 6 VPs before Tim could get there, which may have been the difference; Shawn had a fistful of squires so probably could have won that fight, but each extra spent squire would have cost him a VP, so who knows. Tim probably should have grabbed that County the previous turn, but was behind on Knights and instead placed his 4 on one of the Counties that gave an extra 1-Knight, in hopes of cashing in on one of the Laws and competing for the most Knights bonus. 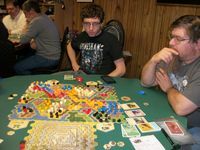 Anyway Caleb finished with 48; after leading most of the game with his French points, he fell behind on his Table of Nobles. Darin ended up with 43, while Elden claims he only scored 29. 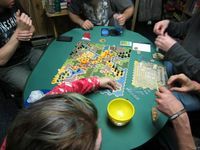 Meanwhile, Alan, Aaron, Cymi, Levi, and Leif played an oddly well-photographed game of Kingdom Builder. The score cards were Hermit, Ambassador, and Miners. Levi was the big weiner, scoring the most in Ambassadors and Miners to finish with 50. 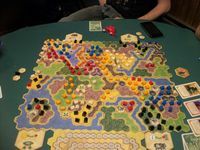 Alan was slightly behind in Miners and Hermits and connected an extra Palace, but could not make up his Ambassador deficit and finished with 45. Aaron and Leif tied with 40, the former with a distributed score and the latter mostly via Ambassadors. Cymi ended up with 38. Meanwhile, Suzie played Dominion. Of course. She was joined at Table Three by Ori, Jerry, and Tom. 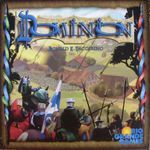 They played with Dominion: Prosperity and Dominion: Guilds, using the Cellar, Stone Mason, Masterpiece, Spy, Monument, Journeyman, Festival, Merchant Guild, Grand Market, and King's Court. The dominant strategy was therefore completely obvious. Suzie crushed her hapless opponents, scoring 64 mighty points. Jerry had the most hap left, with 57, while Tom and Ori finished in the forties. At this point the nattily-dressed New Eric and Kelli arrived and roped Jerry into a quick game of Can't Stop. Eventually they were joined by...but that would be telling. Kelli was the first to capture a column (12), while Jerry soon jumped over Eric to steal column 2. At this point Andy wandered over and joined in - it is not unusual for him to have no markers on board after several turns, anyway. On his first turn he moved all the way up to the penultimate spot on the 5 column. Why he stopped there is anybody's guess - did he not know the name of the game he was playing? Anyway, Kelli then managed to pass over all three opponents (with the aid of the now-kind-of-standard "jump over" rule) to grab the 10 column and threaten the win. Andy then completed his 5 column. ...but it was all Eric from that point on, as he captured columns 7, 8, and then 4 for the victory. Shazam! 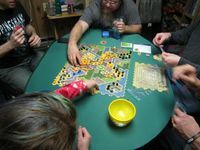 Yet another game of Diamant, this time with Ori, Levi, Suzie, Tom, Aaron, Counterclockwise Scott, and Leif. Despite the fact that the scoresheet excoriates her for being "too cautious", Suzie managed to gather 22 gems for the victory. Leif had 17, Ori and Counterclockwise Scott had 16, Levi and Aaron had 10, and Tom finished with 7. Wait! 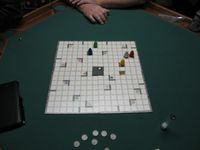 Another game was played directly, with Ori earning 31, Leif finding 29, Suzie gaining 19, Counterclockwise Scott scoring 14, and Levi accumulating 13 gems. 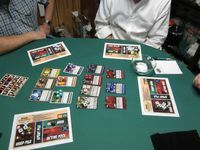 Finding themselves mid-config, Table Two decided to play a lengthy, excruciatingly well-photographed game of Quarriors!. 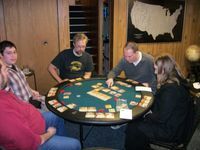 Andy, Eric, Kelli, and Jerry rolled dem bones. Andy, Eric, and Jerry all bought dragons, while Eric managed to buy three portals. But it was Jerry who totally came from behind for the victory. Hooray! 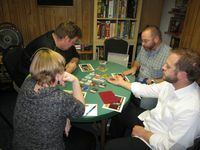 Just to kill a few more seconds, Counterclockwise Scott, Leif, Levi, Ori, and Suzie played what appears to be a single game of We Didn't Playtest This Either. 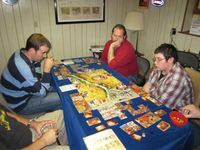 Eric Classic decided to just move into the Lounge in the Official CBBS Gaming Basement, as he set up another game there - this time, the unhelpfully-named Kemet. (Seriously, that sounds like a two-person abstract, probably made out of plastic.) Ben, Eric, Nyck, Nathaniel, and Geoff were the Kemetricians. Ben scored eleven! Eric scored eleven! It went to a tiebreaker! Ben had 7 battle VPs to Eric's 4! Ben won! Geoff had 10! He did not win! Nyck had 7! He did not win! Nathaniel had 4! He did not win! 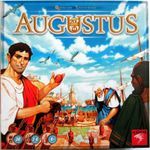 To continue our not-really-successful attempt to get back on-config with filler games, Tim, Shawn, Counterclockwise Scott, Leif, Caleb, and Darin played Rise of Augustus. After the usual discussion about how most, but not all, of the pictures on the cards mean exactly nothing, we got down to the bidness of playing Roman Bingo. This game was Caleb's from the start, as he grabbed both the Gold and Wheat bonuses, got an extra objective down as one of the card bonuses (those are really powerful, especially if you have a really hard backup objective), just edged Shawn out to get the "one of each bonus" card, got to six objectives first to get that bonus card, and then ended the game with seven objectives. All that gave him 82 points. Tim actually thought he was doing pretty well, netting a couple high value objectives and getting a lot icons that scored on other objective cards. 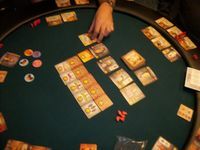 He got the Senator bonus, the four-objective bonus, and even stole the Gold bonus from Caleb until the very last play. But it was only good enough for 60 worthless and pathetic points. Leif got the three green territory bonus and bunch of high value cards to get to 45, while Shawn and Counterclockwise Scott relied mainly on just their objective cards to get to 35. Darin finished with 18. 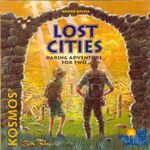 Back in the Cloakroom, Ori and Levi played Lost Cities. The scoresheet is spectacularly unclear, so we'll say that Ori won, 285 to 274, since those are the highest numbers your humble scribe can find anywhere. We finally killed off enough gamers to allow the rest of the front-roomers to convene at Table One. 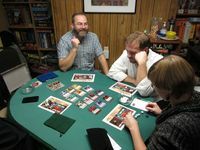 In celebration, we played an intense seven-player game of Shadow Hunters. Tim, Caleb, New Eric, JErry, Darin, Andy, and Kelli were the Shadows, Hunters, and/or Neutrals. 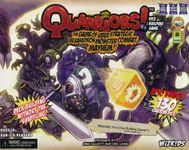 As we have mentioned many times before, seven player Shadow Hunters is very different than eight player Shadow Hunters, as the small teams and increased number of Neutrals makes everybody's motivations a little harder to figure out. New Eric played a Hermit card on Andy and then attacked him, so when Tim played a Hermit card on Andy and then attacked Eric, he thought the implications were clear. Meanwhile, Darin had misread Kelli's Hermit card (the antecedent clause "I bet you are a Hunter" still applies to compound and/or parenthetical terms later on in the card. Thus, even though you have not yet taken any damage, if you aren't a Hunter you still don't take one point of damage, even though it seems like the "Hunter" clause only modifies the previous sentence), causing her to attack him, either because she thought he was somebody else or because she thought he misread the card and wanted to clarify what it meant. Obviously, death is the Great Clarifier in this game, so either one was a valid choice. Eventually Darin (as Brian) succumbed to Kelli's attacks, forcing Jerry to reveal as Daniel. But at this point Andy got confused by Kelli's actions, as she attacked Eric after some Hermit actions, which suggested that she was not on his team and, ergo, on Andy's team. But Tim had already staked his claim as Andy's ally. Eventually, Kelli polished off New Eric, who revealed himself to be Emi, so everybody who was paying attention should have known Andy and Tim were the Shadows. 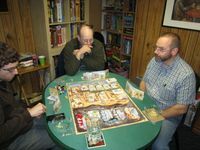 At this point Caleb was also killed by Kelli (your scribe dimly remembers something about a machine gun), forcing him to reveal himself as Catherine - who had been trying to kill of Tim and Andy to force the game to end with just him and Kelli left. 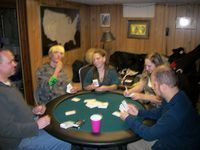 At this point, with one Hunter (Kelli), one virtual Hunter (Jerry, as Daniel) and two Shadows (Tim and Andy) left, the teams really were clear. Jerry, accordingly, attacked Andy with his gun - allowing Andy to reveal as the Werewolf and slay the final Neutral with his counterattack, securing a win for the Shadow team. Hooray! Kelli showed herself as Gregor at the end, while Tim waited all game for somebody (anybody) to get to the Erstwhile Altar so he could reveal as the Ultra Soul and blast them with his Murder Ray. He'll have to console himself with his team's decisive victory, instead. It now seemed like the perfect time to try out Tim's "new" acquisition, Spot it! Party. This is a new and improved version of Spot it! - the improvements consisting of some weird card holders and an even weirder non sequitur of a large, toy hand. Anyway, Tim, Caleb, Darin, Jerry, Eric, Kelli, and Andy were the Spotters. There were actually six games in the rules for use with the deck of cards, but all of them follow from the fact that there is exactly one symbol that matches on any two given cards. So the idea is to be the first one to call out the name of the symbol that matches. Andy suggested playing all the games in a series and adding up the scores (since each one takes like five minutes to play). The problem with that is that the scoring levels for each game are not the same, and some of them are designed to have one winner with no real way to get a score at all. Anyway, a typical game would be to give everybody one card and put a stack in the middle, then as you find the matches you call it out, take the card onto your stack (revealing the next one), lather, rinse, repeat, until all cards are gone. Whoever has the most wins. 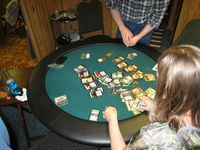 Or, you might give everybody a stack of cards, and then flip them at once; if you find a match with an opponent, you give them your cards (so he has to learn a new one), and the last person to have any cards left is the loser and has to take them all. Whatever, you get the idea. There's also this hand thing, which you can grab if you see a card with a hand symbol on it, that gives you some random amount of points or something at the end. We ditched the hand, because it was stupid, and now Tim is angry that they were out of regular Spot it! and he had to buy this hugely overboxed thing with its pointless hand instead. Fie! After six rounds of this nonsense, using an ad-hoc scoring scheme, we were all shocked to discover the Tim, who both owned the game and kept the scoresheet, had won, with fifteen points! Hooray! Caleb and Kelli each got 12 points, Andy had 11, Jerry scored 9, Elden finished with 3, and Darin got zero. Since some of the games gave you negative points, a zero score actually indicates some success, somewhere. Hooray! 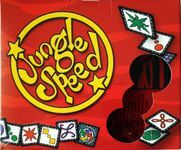 The final game of the evening would be a rousing and dapper game of Jungle Speed. Andy, Tim, Caleb, Darin, Jerry, Eric, and Kelli all remained to try and grab that elusive totem. Then everybody went home. The end. One cannot be expected to game seriously without a generous helping of gamer fuel. 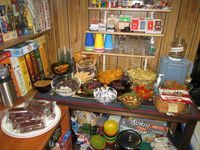 Thus, a substantial snack table was once again on display. Sara Lee fake chocolate Twinkees, Sesame Sticks, Beef Jerky, Dark Chocolate Peanut M&Ms and Reeses Pieces, Chocolate Pretzels, Sugar Free Vanilla Wafer Cookies, Dark Almond Roca, Spicy Sweet Chili Doritos, Huckleberry Taffey, Sugar Free Chocolate Dipped Wafer Cookies, Deluxe Mixed Nuts, Juju Fish, Sea Salt and Vinegar and Jalapeno Kettle Chips, Apple Cinnamon Cookies, Fig Newmans, and some weird Red Bean and Brown Rice Triscuit things all served to provide the energy we would need to make it clear until 1:30am. Sheesh. We are getting old. Also, Elden brought lots of Killian Korn, and I think there were cookies or muffins or something brought by somebody else. I should probably try to take some pictures of the snack table in the early evening, after everybody has brought their snacks but before the early leavers have taken the leftovers with them. Eh. 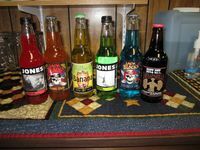 A rainbow of flavor, to compliment our usual assortment of Light Lemonade, Fresca, Dr. Pepper 10, Diet Sunkist, and Pan Galactic Gargle Blasters.